Explore the best of Costa Rica with this 8 day, 7 night Volcano-Jungle-Beach vacation! See the three most sought-after areas of Costa Rica and enjoy fun adventures at the Arenal Volcano. Then, get a deeper experience in the jungles of Monteverde and the mystical Cloud Forest. Finish at the beach of Playa Samara in one of the world’s blue zones. One of our friendly drivers will pick you up at the airport to take you about 3 hours through rolling hills and enchanting valleys tucked away in lush rainforest. You’re bound to see some wildlife as you make your way to the base of the Arenal Volcano. Check in to your hotel and be sure to rest up for your exciting week in Costa Rica! 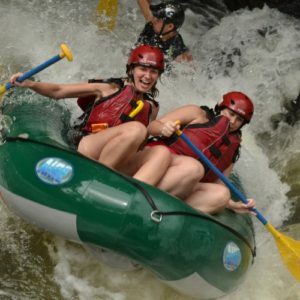 Enjoying a Costa Rican river is one of the best ways to combine nature and adventure! Go canyoning in the Lost Canyon! Combine thrills with beautiful Jurassic Park-like scenery in one of Costa Rica’s most popular tours. 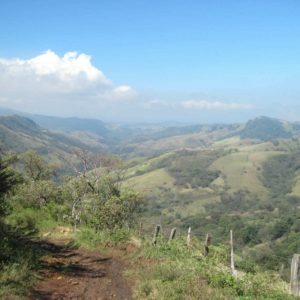 A scenic and adventurous way to reach the Monteverde Cloud Forest! Vamos a la Playa! This morning you’ll take a shared ride shuttle to the fun and dynamic beach town of Playa Samara to watch a Pacific sunset and chill out with the bohemian surf culture. Paddle out to Chora Island, recently declared a national wildlife refuge, and explore the surrounding waters with a mask and snorkel! Enjoy a free day at the beach to relax and soak up the sun! You can also upgrade with these great options at an extra charge: wildlife birding & kayaking, dolphin watching, turtle observation. ADIOS Amigos! It was great having you in Costa Rica! We hope you enjoyed your time here and that you’ll come back soon! 8 DAYS & 7 NIGHTS of PURE ADRENALINE! Get your adrenaline pumping in tropical paradise! Costa Rica is a natural playground because of its rushing rivers, vast coastlines, lush rainforest, tropical waterfalls and fascinating volcanoes. Rappel down waterfalls and mountain bike through rough & tough terrain at the Arenal Volcano. Head to the Monteverde Cloud Forest by boat to experience a zipline adventure of a lifetime! Finish off this exciting vacation with a few days at the beach with opportunities to try stand up paddling or ocean kayaking!